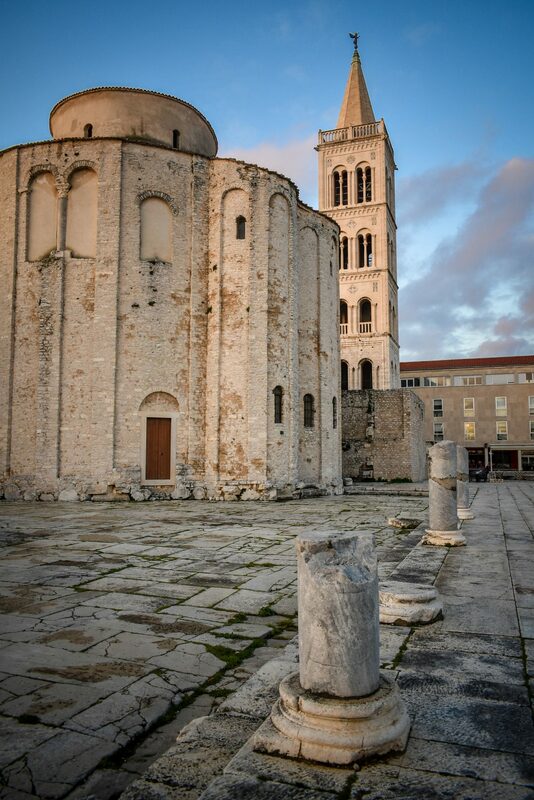 The city of Zadar is Croatia’s oldest inhabited city, its history dating as far back as the 9th Century BC. 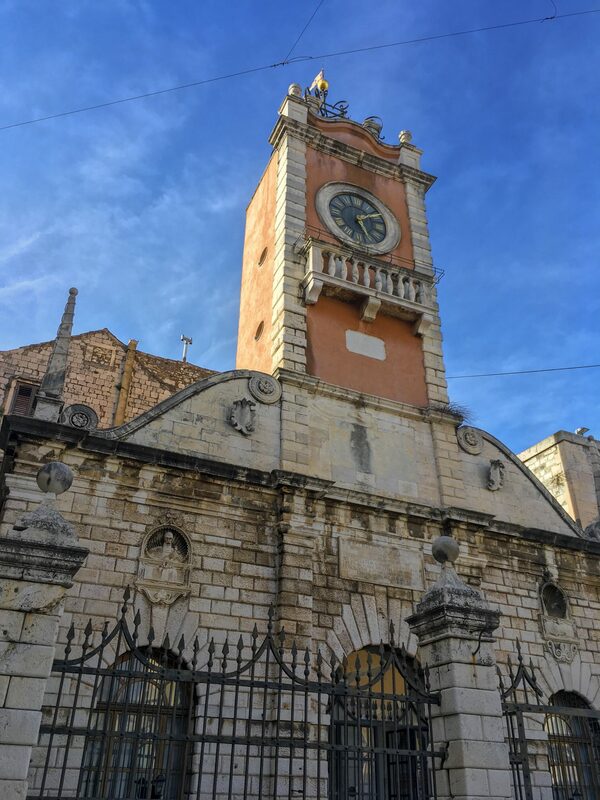 With a perfectly formed old town on a peninsula with the Adriatic wrapped around it, exploring this destination within 48 hours is totally achievable, but will always leave you wanting more. 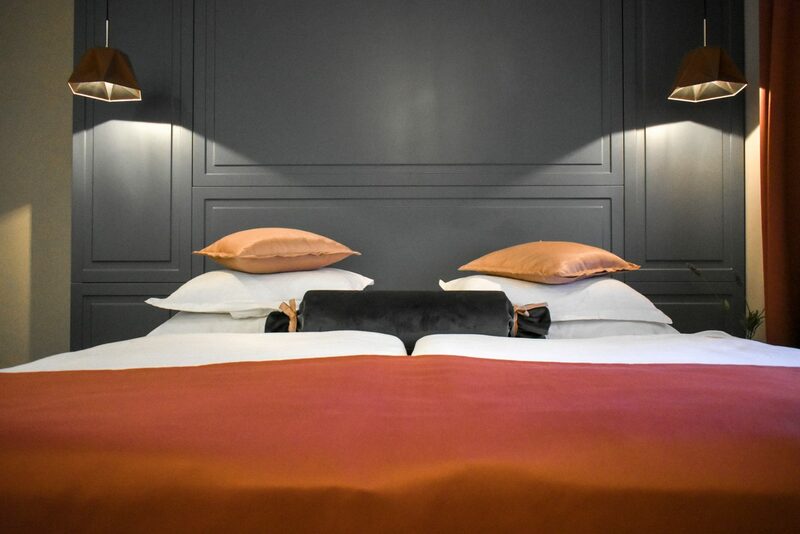 We stayed in Zadera accommodation, which is kind of like Airbnb-meets-boutique hotel. 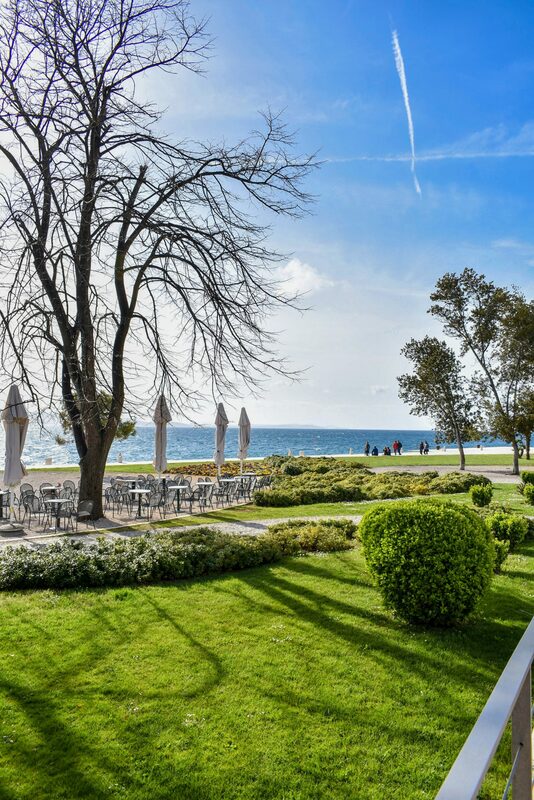 Set in a complex at the northern tip of the old town peninsula a step or two away from the harbour and Adriatic Sea. 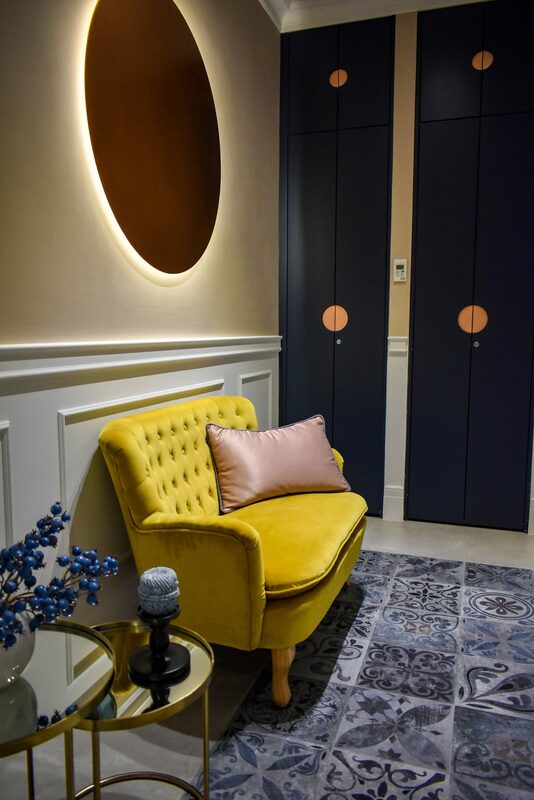 Modern and beautifully styled, it’s the epitome of boutique with all the mod cons you could hope for and newly-opened within the past year. 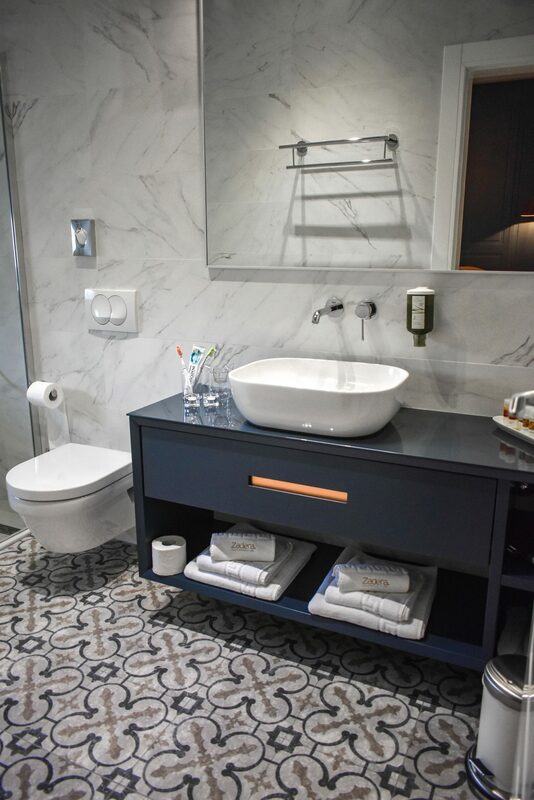 Expansive, brand new bathrooms with walk-in rain showers; queen-size beds stacked with sink-into pillows and individual blankets; ample hanging space and both cosy armchair corners and expansive desk spaces. 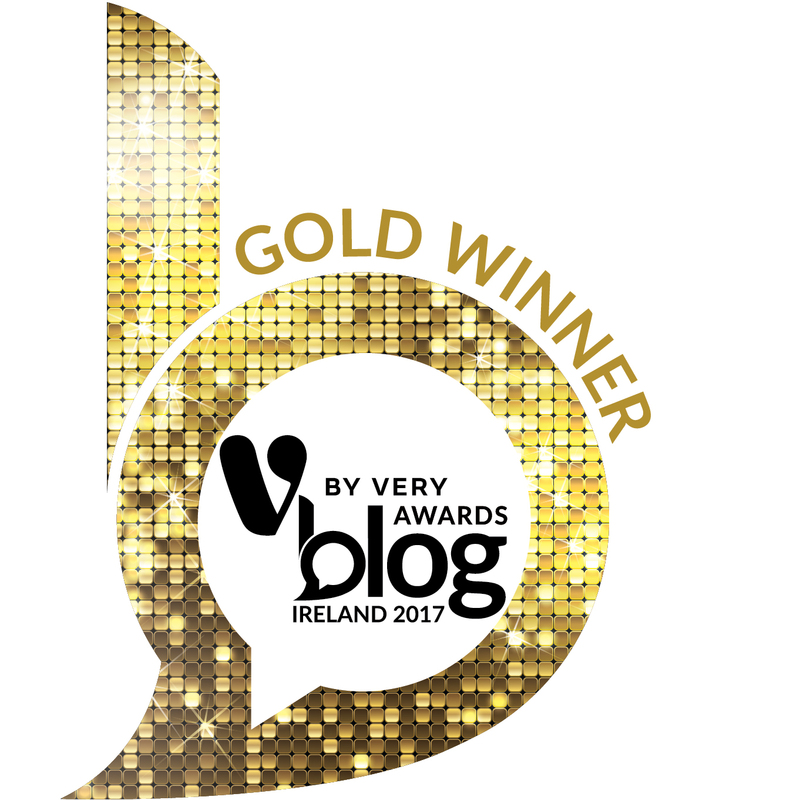 We were so lucky to stay there as we actually didn’t even choose our accommodation – Srprs.Me organised it all as part of their service (read more!) and we think they played a blinder and picked one of the most amazing places to stay in the city. 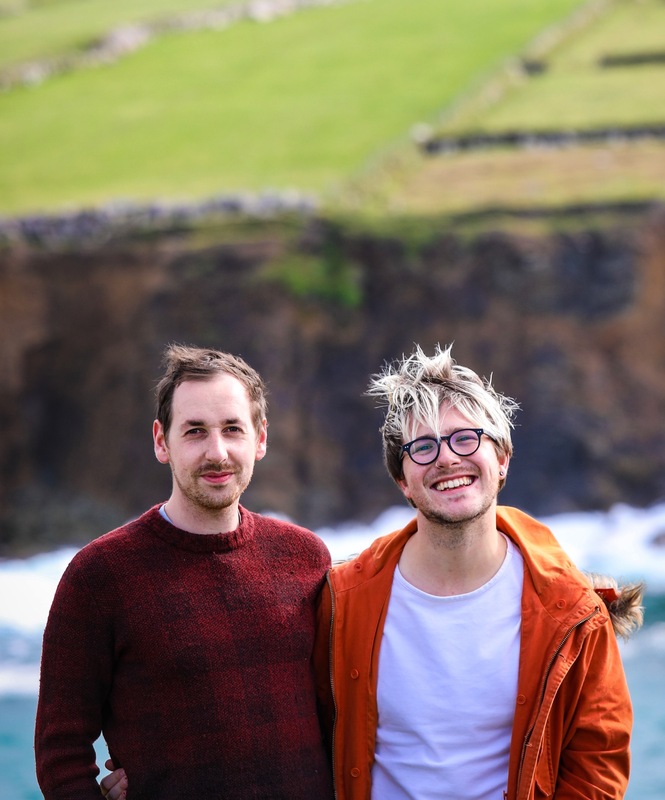 Zadera is only open around a year so far and oddly don’t have a direct website but is widely available on booking websites if you search them – or you can email them directly. 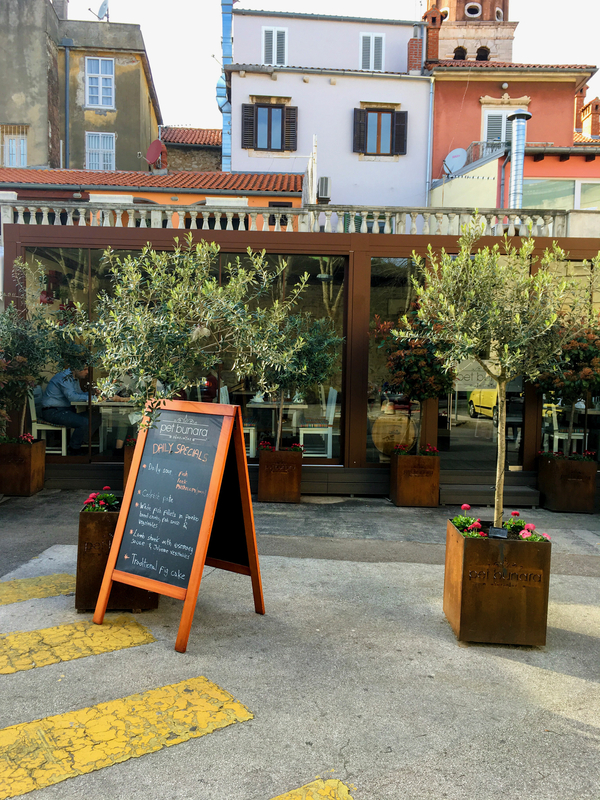 Across the street is Hotel Almayer, where a wonderful breakfast spread is served each morning in the Corte Restaurant if you’re a guest of Zadera. The hotel looks like another great option to stay at within this historic district. 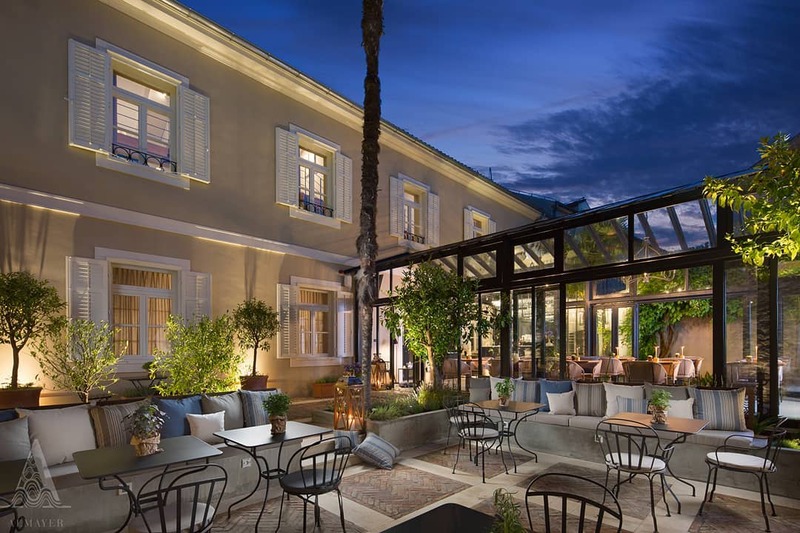 Starting the day in their beautifully styled sun trap conservatory is really special – so you’ll get to experience that whether you stay in either of these places! 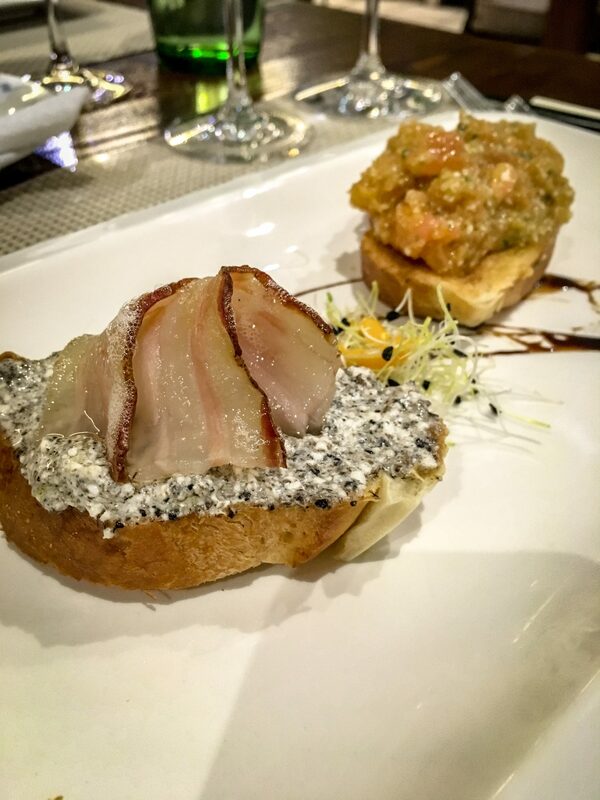 Bruschetta is an inexpensive lunch or dinner spot which mixes traditional Italian and Dalmatian cuisines. 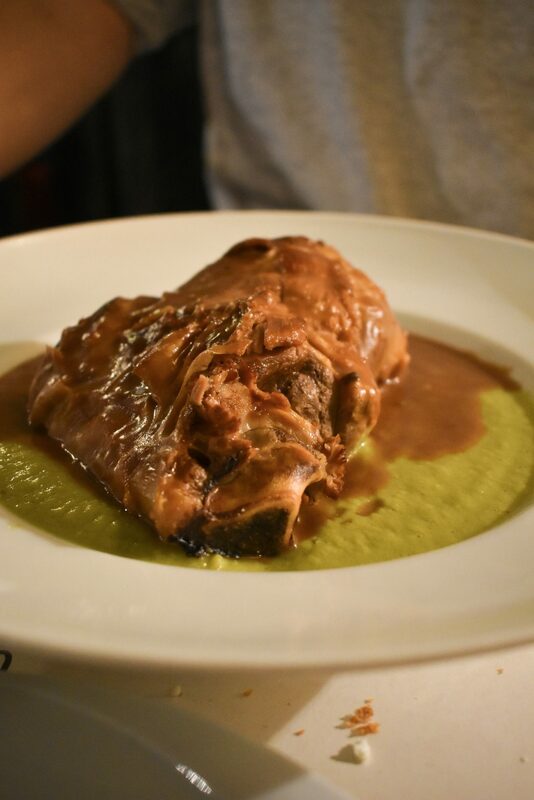 A wide-ranging menu, small wine list and lots of spirits come paired with excellent service. 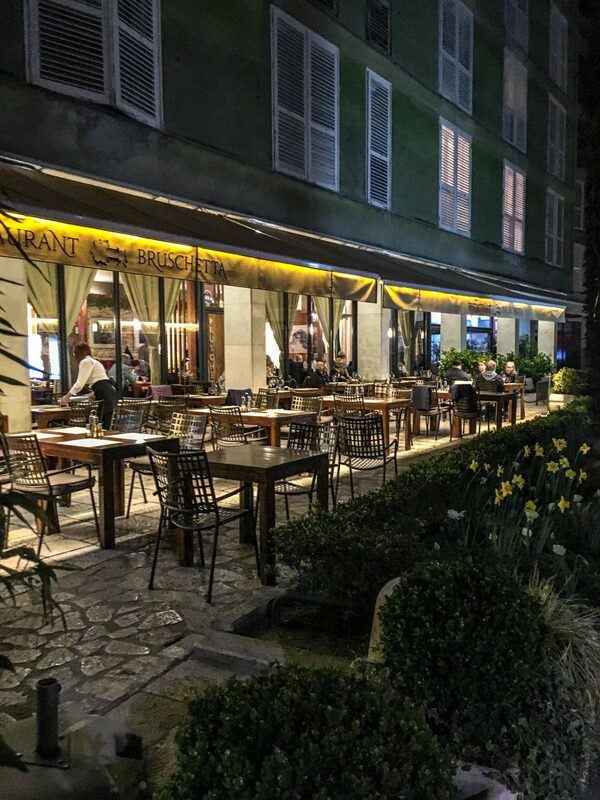 Tables for dinner can be harder to come by in the evenings without a booking but there’s an expansive terrace within earshot of the lapping Adriatic, ideal when the weather’s mild or warm. 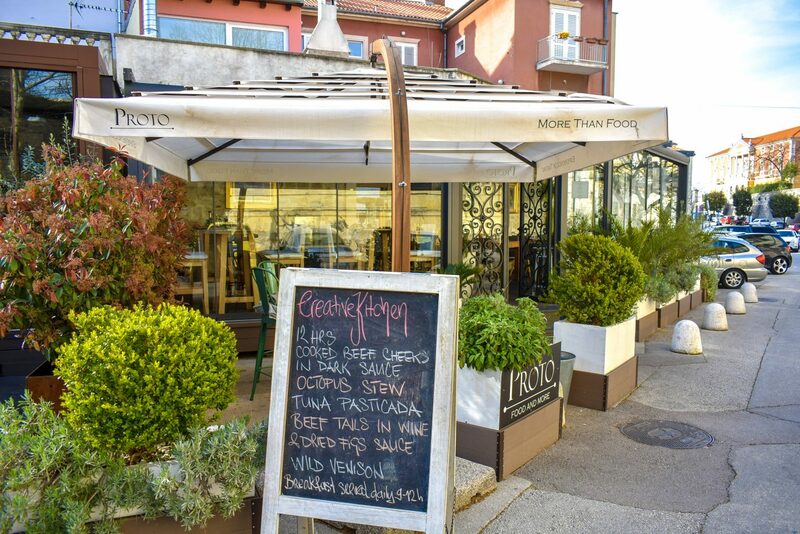 We had dinner on one of the evenings and tucked into starters of smoked tuna – Dalmatia is famed for its tuna in every type of way so you’ll see it on most menus – and local Great Taste Award-winning Pag cheese. 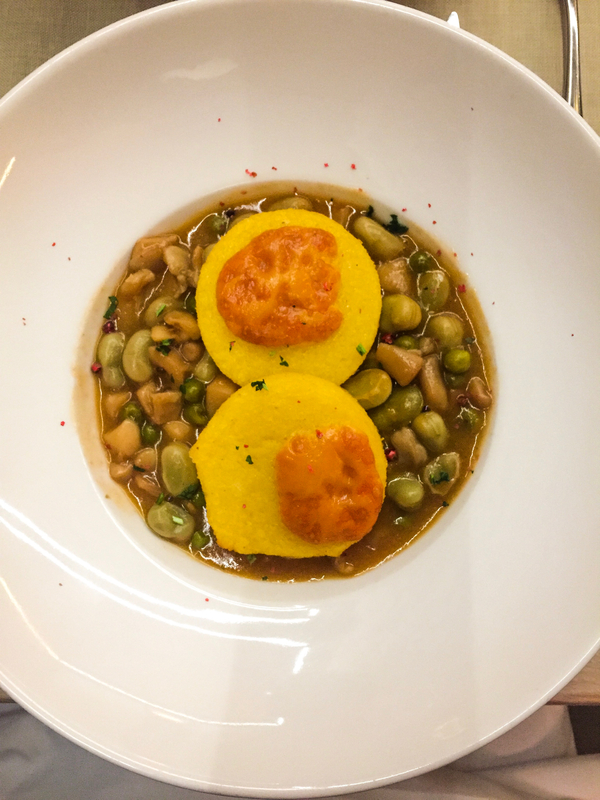 For mains we had Brodetto, a cuttlefish stew topped with rounds of polenta, and seared tuna with chickpea puree and local vegetables. Sounds like it doesn’t all work together but it seriously did, so there’s magic happening with flavours here. 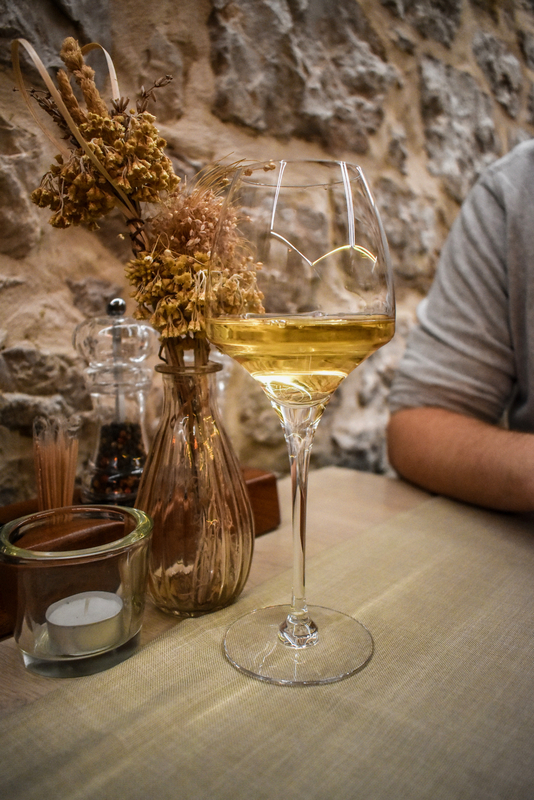 The restaurant has a huge wine list and is particularly passionate about orange wine, which we loved! 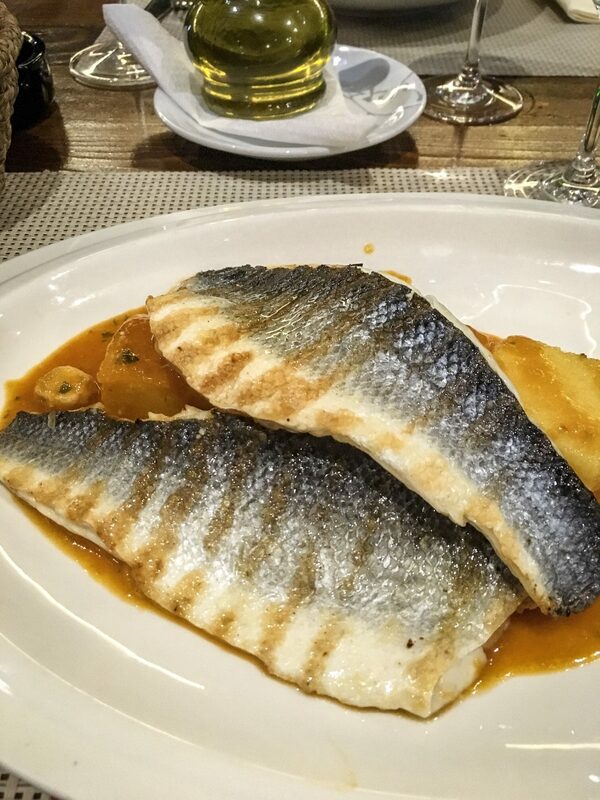 A two-course meal with a couple of drinks each cost about £65/€70. Whilst Pet Bunara has been a staple on the square for over 35 years, next door Proto is the new kid on the block with just about a year under its belt. 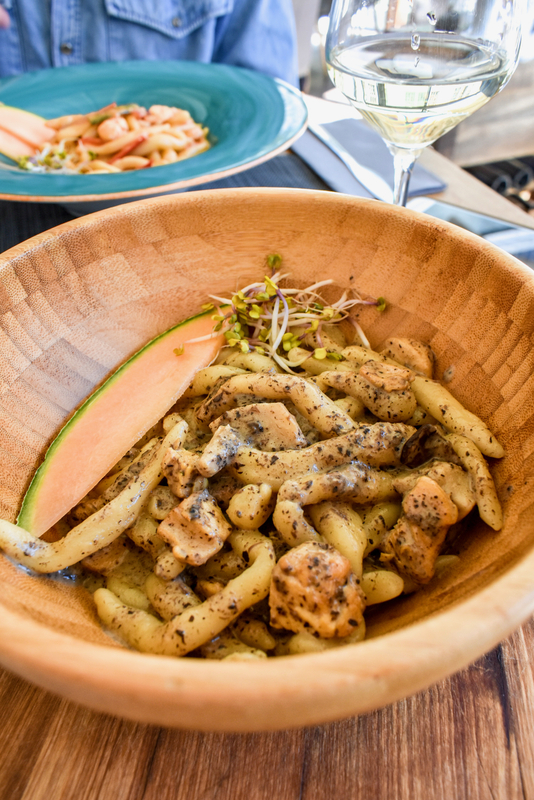 For lunch another day we both had plates of pljukanci, a type of rustic, hand-rolled pasta from Istria in the north of Croatia. One of us had a gorgeous mushroom, chicken and truffle version and the other had the ‘special’ of Adriatic (small) prawns and local vegetables in a light, tomato-based sauce. 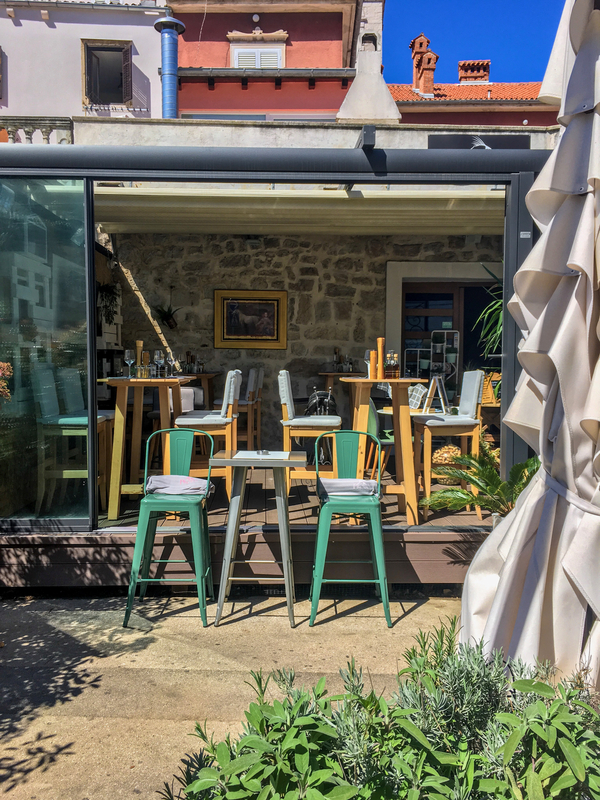 A similar style of cookery – local, seasonal, Dalmatian – with another fantastic wine list (mostly Croatian) and a dizzying variety of spirits available, these two restaurants were two of the best we tried and the pair of places we would recommend the highest. 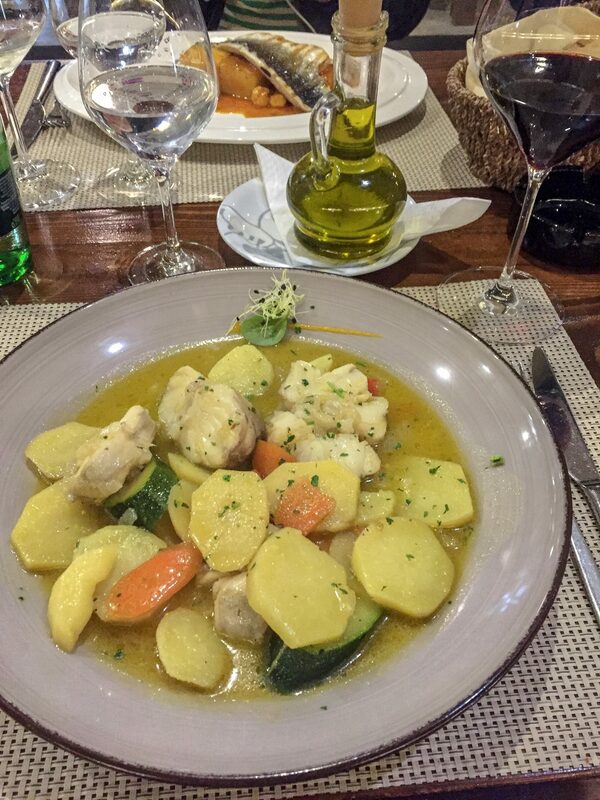 For more traditional, Dalmatian dishes and eating where the locals eat, try Bistro Pjat for lunch. 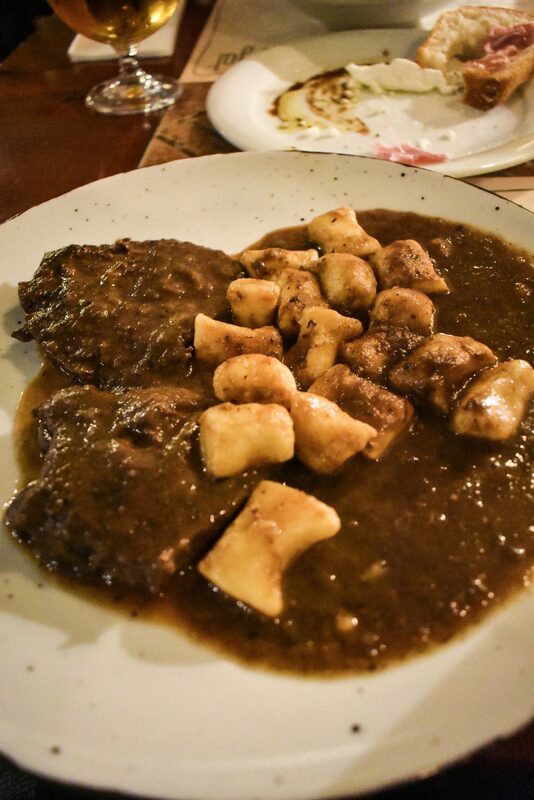 A konoba (tavern-style, traditional bistro) with an expansive menu offering everything from soup and salads to meat, fish and pasta dishes. 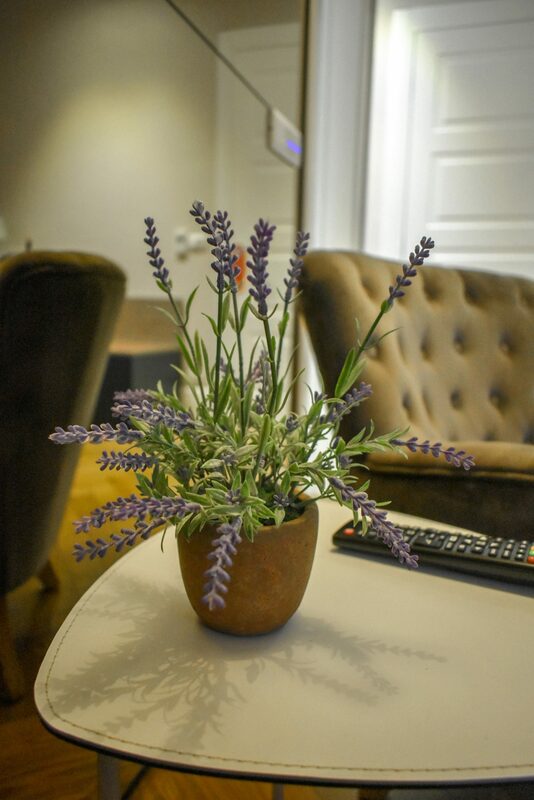 Service is familiar, friendly and local whilst the interior harks back to the past. 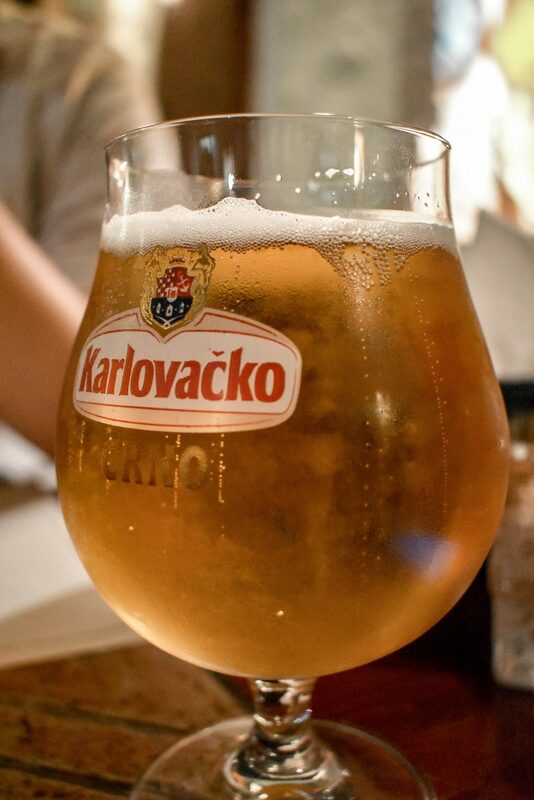 The flavours are good and the value is great – we shared a starter, had two substantial dishes each and round of large beers and it was £25/€30. 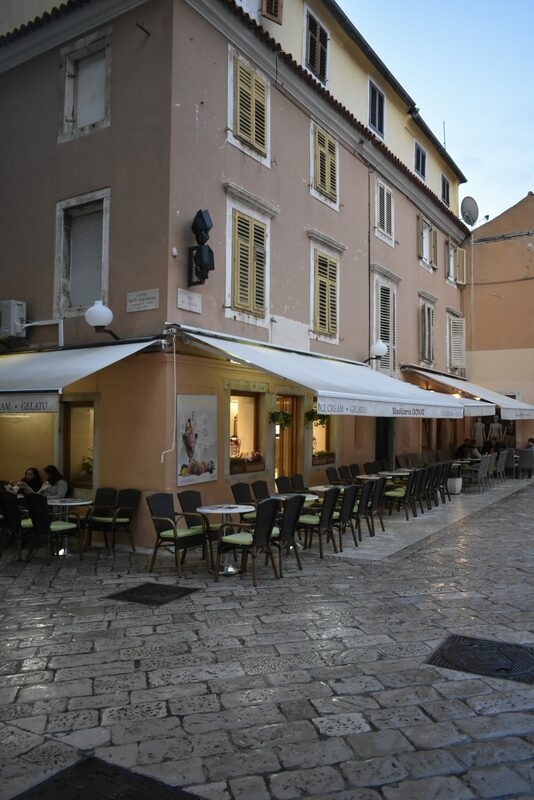 Amidst so much heritage, history and jawdroppingly beautiful architecture, we loved the waterfront area of Zadar. 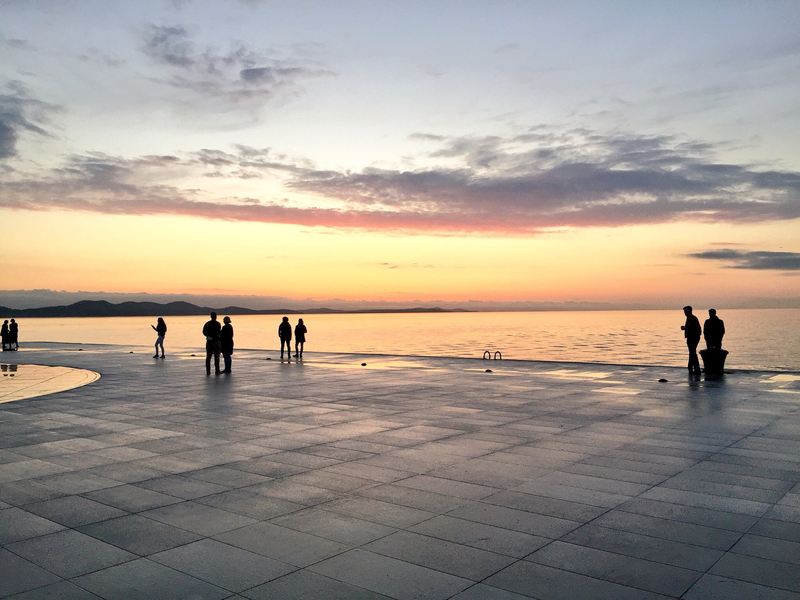 Right by the lapping Adriatic with an unspoilt, breathtaking view across to the Croatian islands, a stroll along this stretch day or night is fabulous, but sunrise and sunset are particularly captivating. Expect crowds, especially when the weather is perfect. This spot boasts of the most beautiful sunsets you’ll ever see – Alfred Hitchcock, who visited in 1964, said it’s “more beautiful than the one in Key West, Florida, applauded at every evening” as he looked out sipping Maraska. Prepare to be mesmerised and maybe moved to tears. 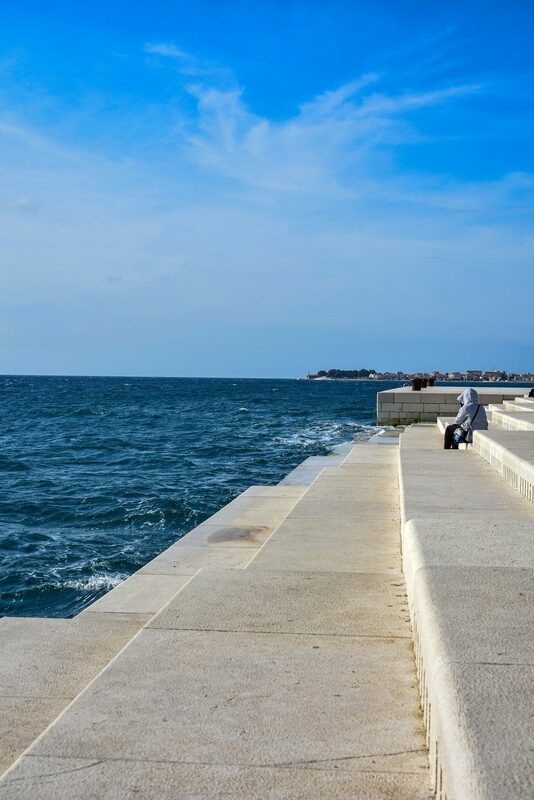 The Sea Organ is an unbelievably simple but complex and clever piece of architecture where the Adriatic’s waves make music 24 hours a day. 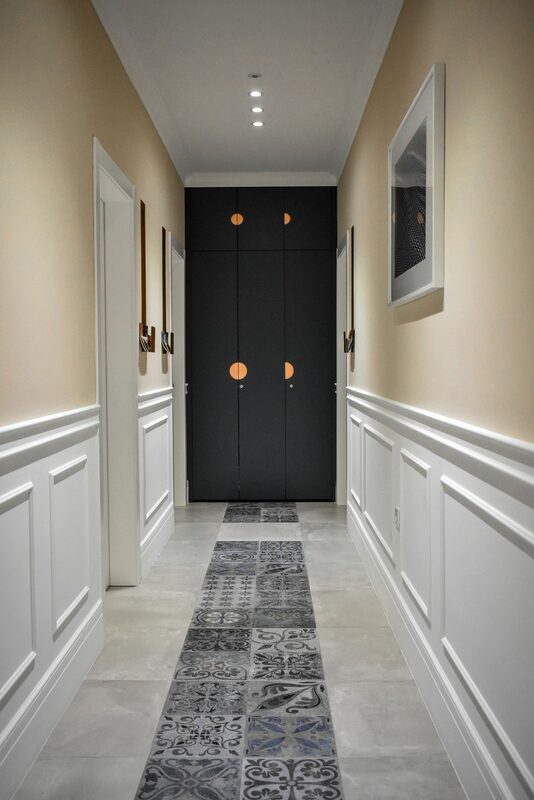 Architect Nikola Bašić designed this space, which looks like a series of simple white marble steps walking into the sea. What happens is incredibly enchanting, almost haunting dance between nature and art. 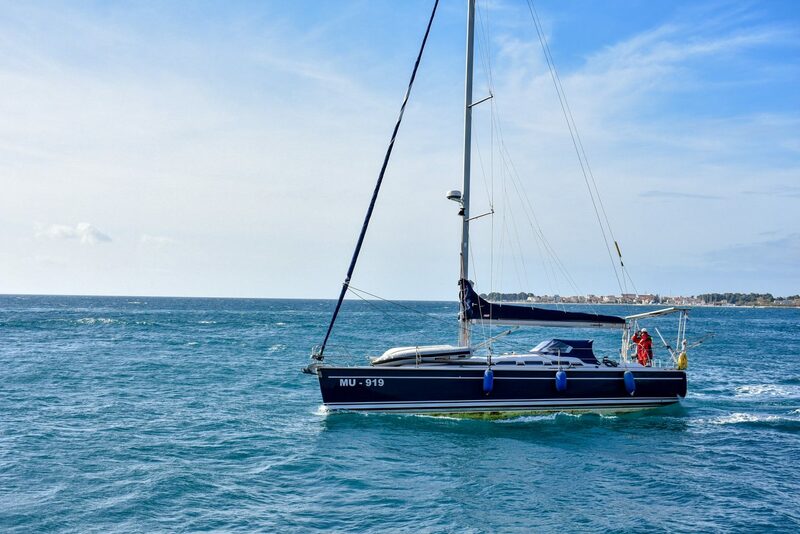 The lapping aqua-hued waves of the Adriatic create a symphony from the force of hitting against the quay and pushing air through ‘organ’ pipes to produce sound. On a calm day, a gentle hum may play faintly but on choppier occasions, be prepared to hear a full orchestral soundtrack being performed. You’ll find yourself spending hours just sitting and relaxing here. Paired with the view, it was our favourite part of the city. The Sea Organ opened in 2005 and was later followed by the nearby ‘Monument to the Greeting to The Sun’, which was designed by the same architect. 300 multi-layer solar panels conserve sunlight during the day and when the sun sets, a light show begins. Illuminating an area that’d otherwise be darkened by the night sky, it’s hugely popular with tourists. Smaller circles representing the planets link the structure to the Sea Organ. 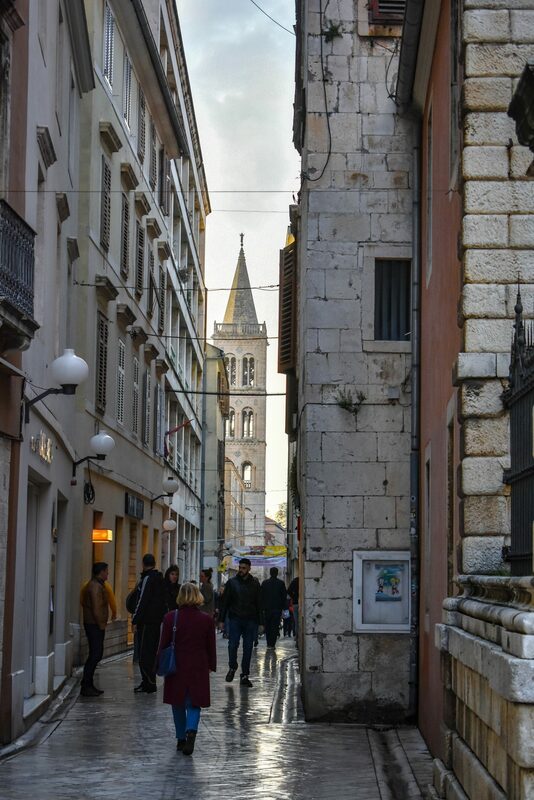 The old town of Zadar is dripping in history. 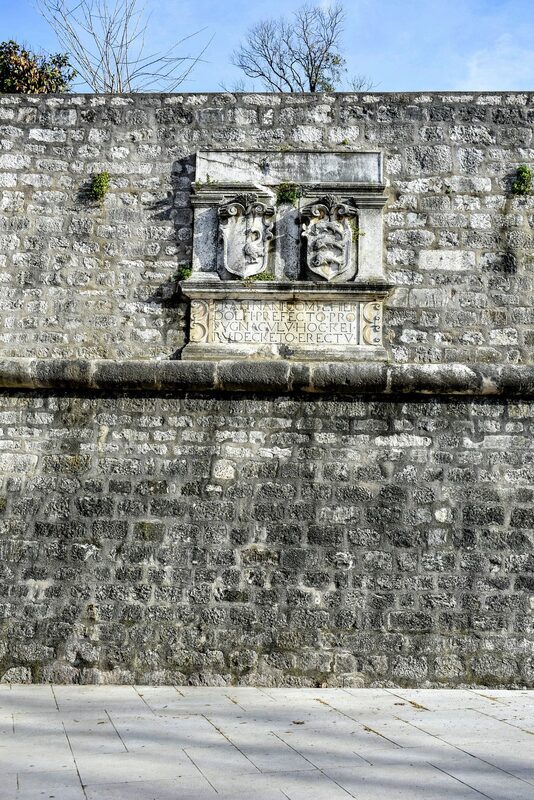 The City walls/gates were built as a defence against the Turks. Being a city on the Dalmatian coast, it has been conquered and invaded plenty of times over the decades. Despite sustaining significant damage during World War II, there’s still a huge amount of the structure remaining, but it no longer surrounds the entire town. 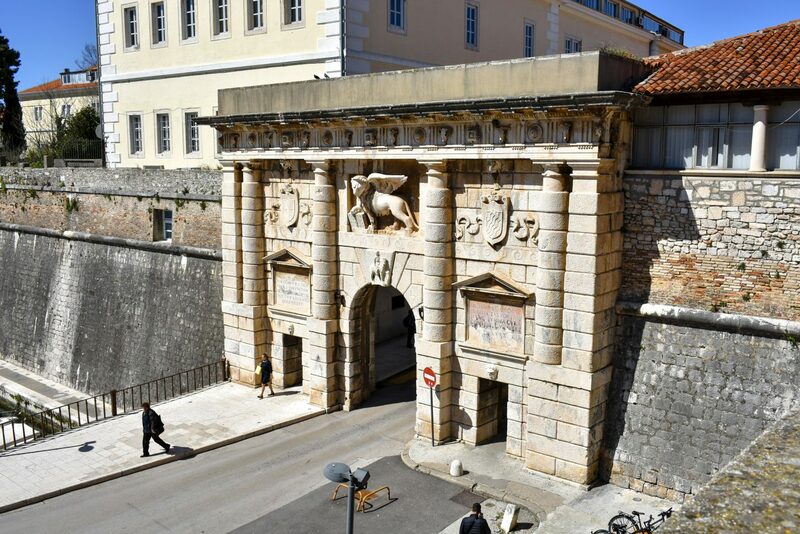 The Renaissance Venetian gate beside the Queen Jelena Madijevka Park and the small marina opposite on one side then joins with the older structures on the seafront. Over the other side of the peninsula, the walls are also the road into the city, with the cobbled thin streets beneath. 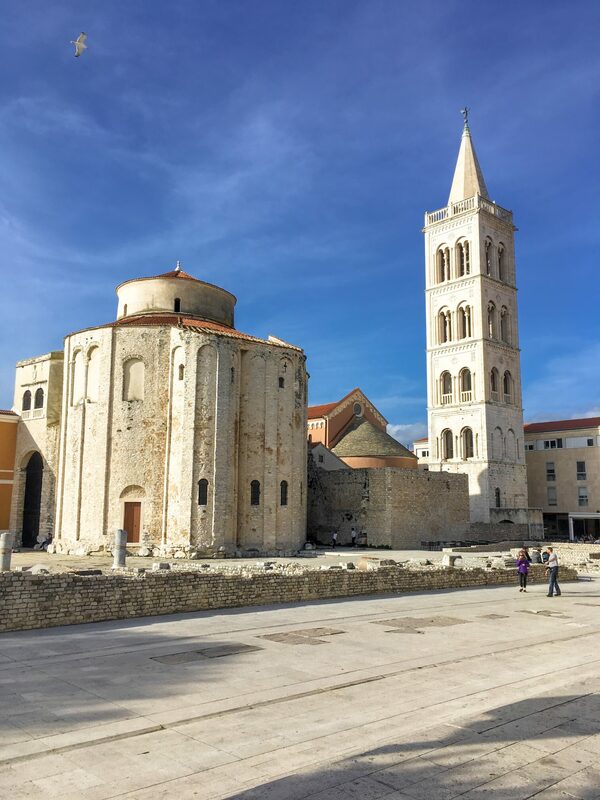 Zadar is one of the most historic cities in Croatia with ample religious sites; churches, cathedrals, towers and palaces are found in every corner of the small city, from several different ages. 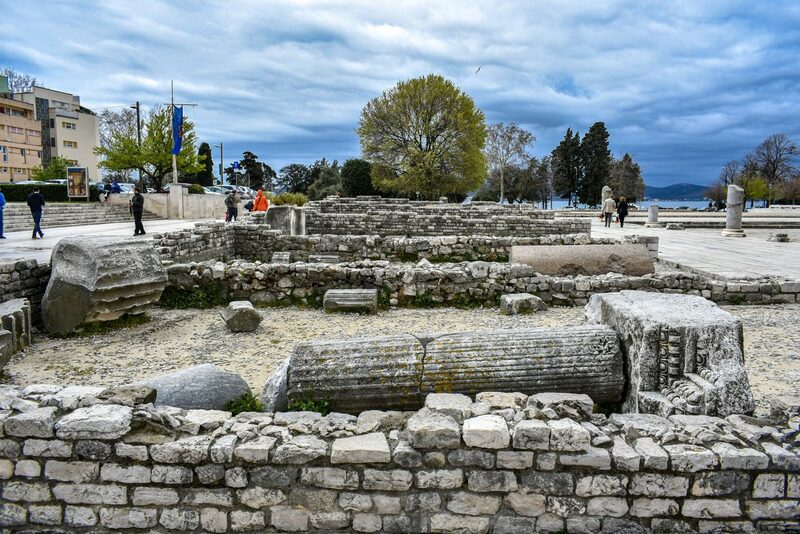 You can see the elements of its former Roman rule in the architecture and structure of the old town – rectangular, organised streets, a walled surround, city gates and typical areas of the time of Caesar and Augustus, forums, temples and amphitheatres. 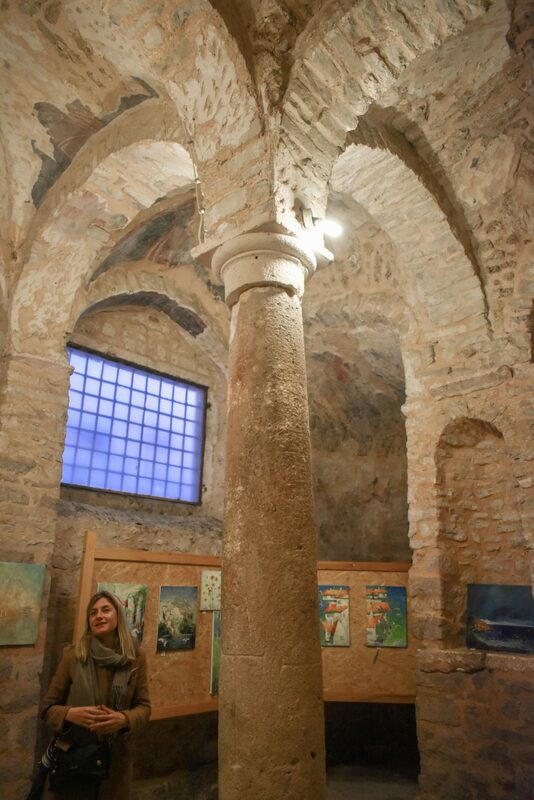 Some historic sites and deconsecrated churches are now being re-used in modern ways – for example the gift shop and gallery at the Church of St. Andrew and St. Peter the Elder’s, former St. Laurence’s Romanesque Church (11th Century) within Sveti Lovre on Narodni Trg (People’s Square) and Five Wells Square (trg Pet Bunara) which in the summer turns into a huge pop-up nightclub, hosted right beside the old city walls. Want to mingle with the locals? The People’s Square (Narodni Trg) may not look like much but it’s really the heart and meeting point of the city. The main building on the square, City Hall, is relatively new (1935) – it’s in Italian fascist style and the fresco-style panels all around are other, reflecting the regime in place around that time. The frescos showing various landmarks from across Italy and the occupied Dalmatian coast. 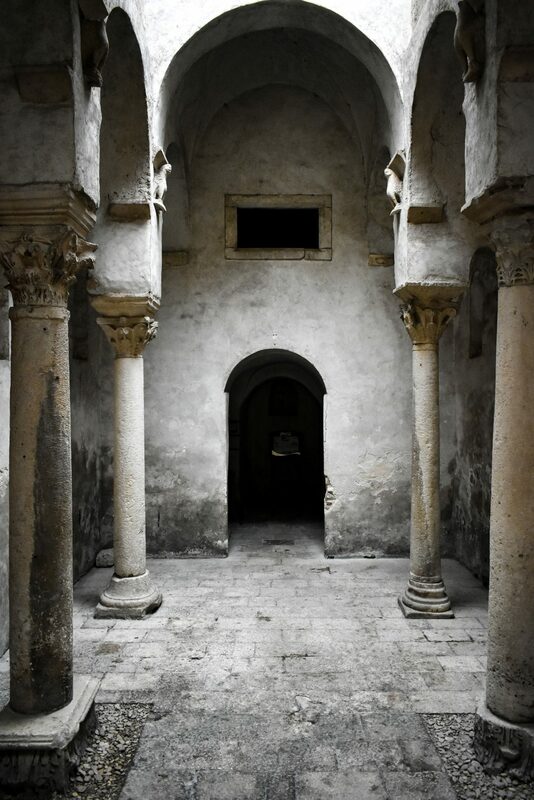 The Benedictine nuns have been in situ in Zadar since the 7th century and are some of the most learned people on the history of the area. 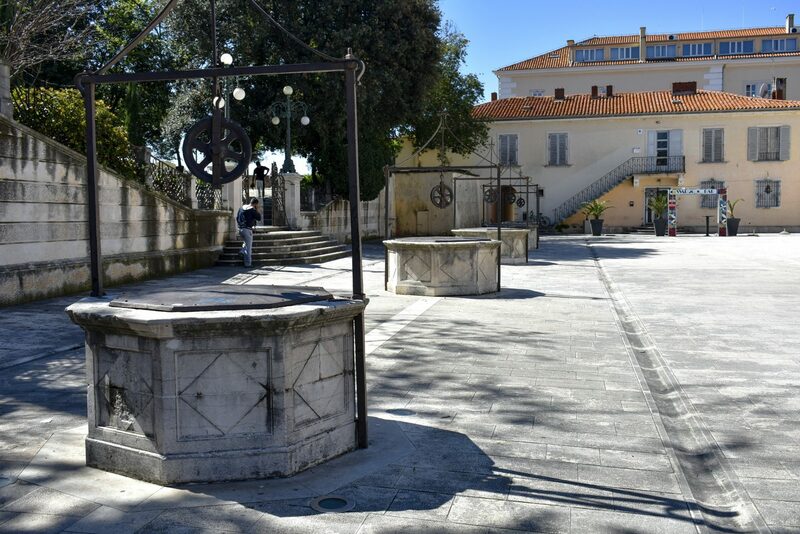 They operate a museum, fabulously titled The Gold and Silver of Zadar, within their convent which holds within some of the most incredible relics, religious artefacts and artworks in the entire world. 30kn entry per person, this is well worth a 45 minute trip around – though no photography is allowed, so you’ll just have to absorb it all into your memory. Still operated exclusively by the nuns themselves, you’ll spot a few of them along the way too! Check opening hours first, as they operate around their prayer schedule. 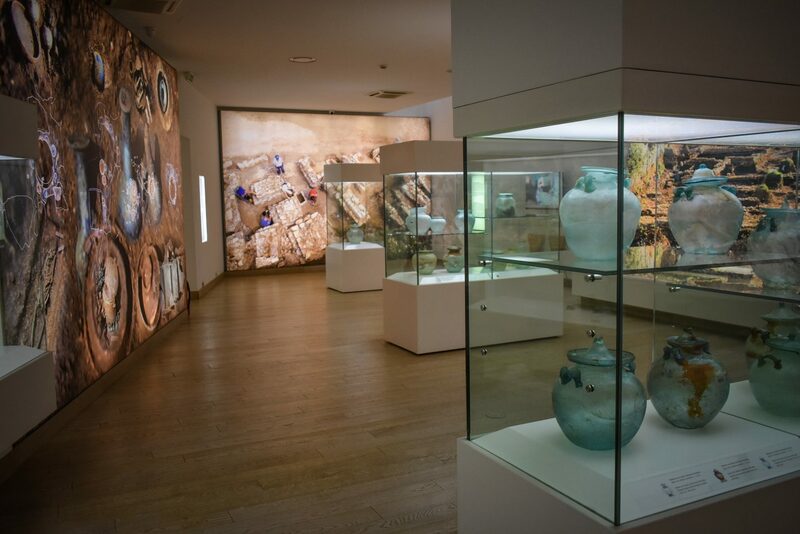 You might have never appreciated the role glass has played through the ages, but a fascinating exhibition stands atop the city walls. 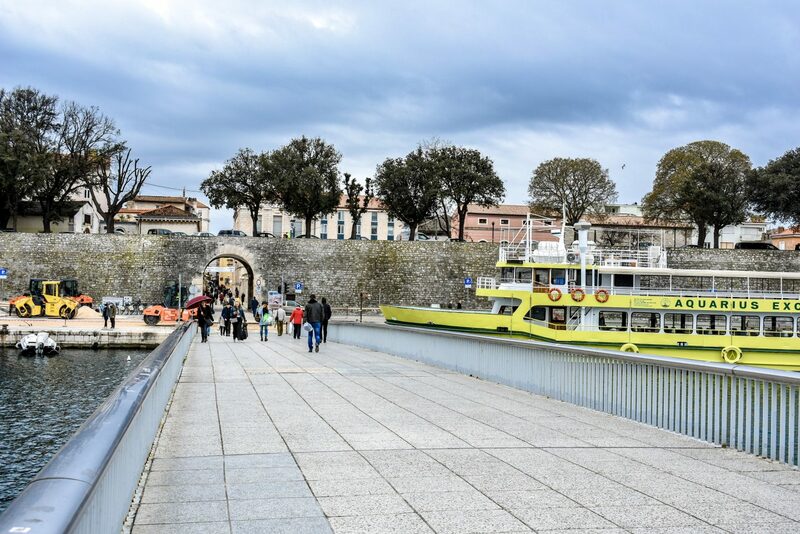 The Museum of Ancient Glass, set in a resplendent former palace overlooking the interior harbour, tells the story of glass through the ages – the process of which hasn’t actually changed much from when it was first discovered! 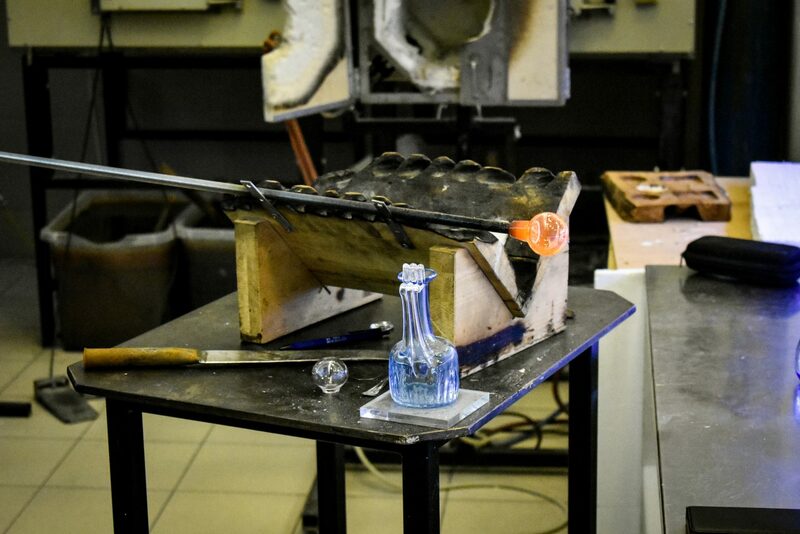 See beautiful glass artefacts through the ages found in and around Zadar and also visit the glassblower on the second floor to see a live demonstration of how to create glass objects. Absolutely fascinating and well worth a visit, not least for the gorgeous items in the gift shop at the end! Entry is 30kn for an adult. 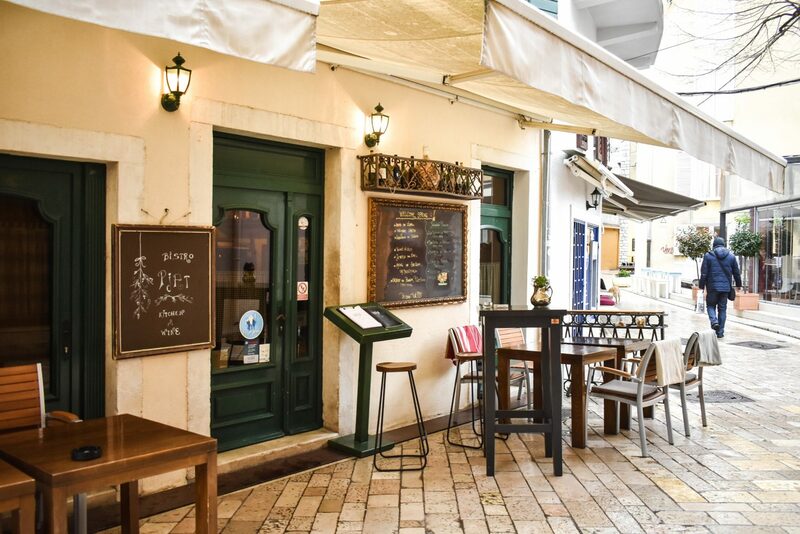 A cute corner shop cafe by the Sea Gate, Cogito is a modern, cosy cafe with great coffee. 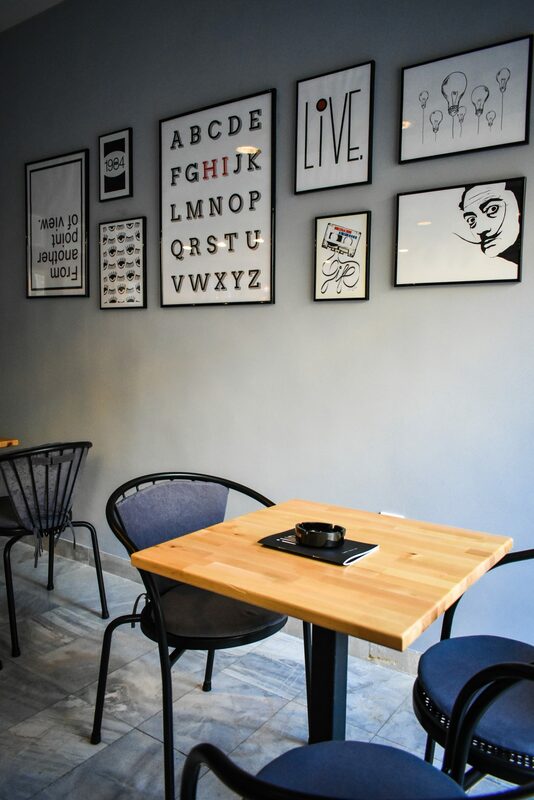 Offering something other than strong Italian-style espresso, here you can enjoy the likes of silky, perfect temperature flat whites or drip coffee via chemex or V60. 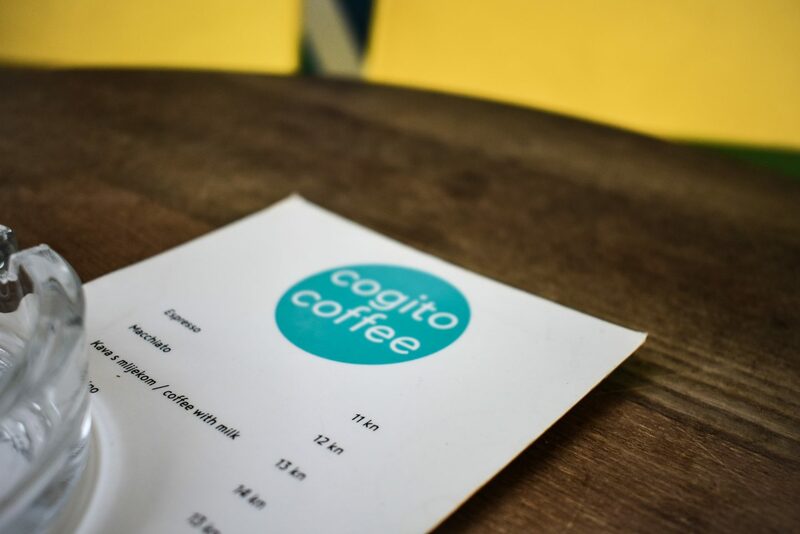 A relative newcomer to Croatia’s speciality coffee scene, Cogito began as a roastery and cafe Zagreb in 2014 opening a number of branches in the capital before spreading out to Zadar and Dubrovnik. 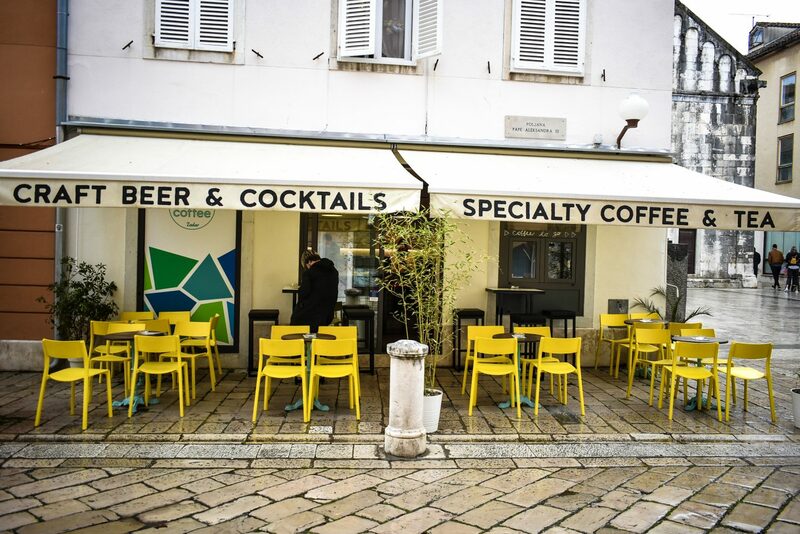 Speciality coffee in a tiny, picturesque corner of Zadar. 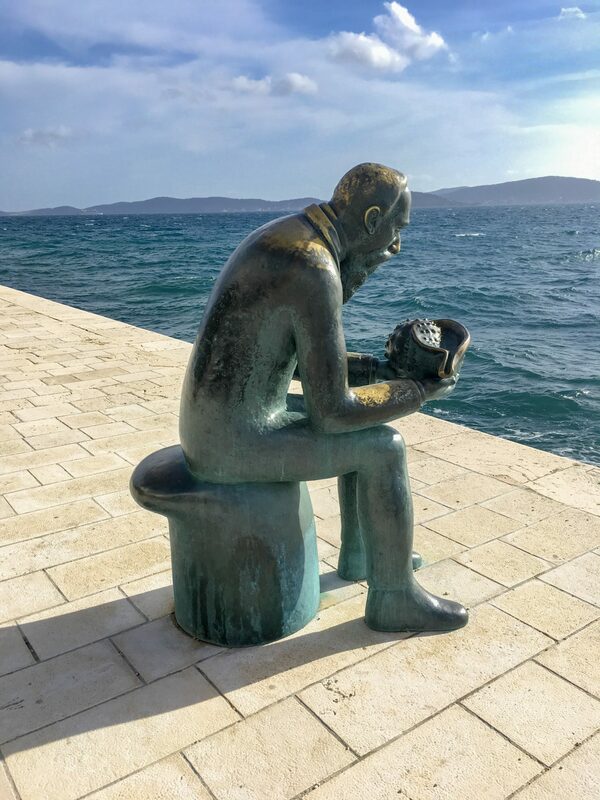 Look for the statue of Croatian novelist Petar Zoranić and you’ll find it! 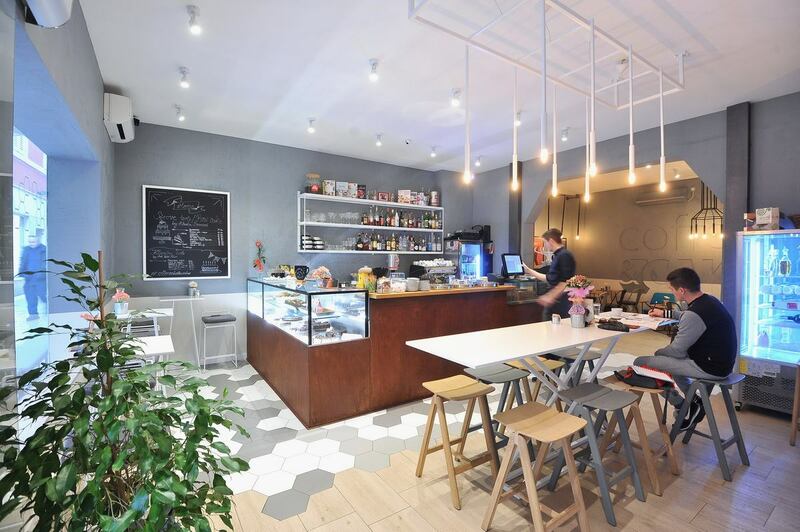 Drawn in by the newly-renovated interiors of Coffee & Cake on Ulica Braće Vranjanina 14, your attention will be grabbed by their line-up of delicious and delicate patisserie. 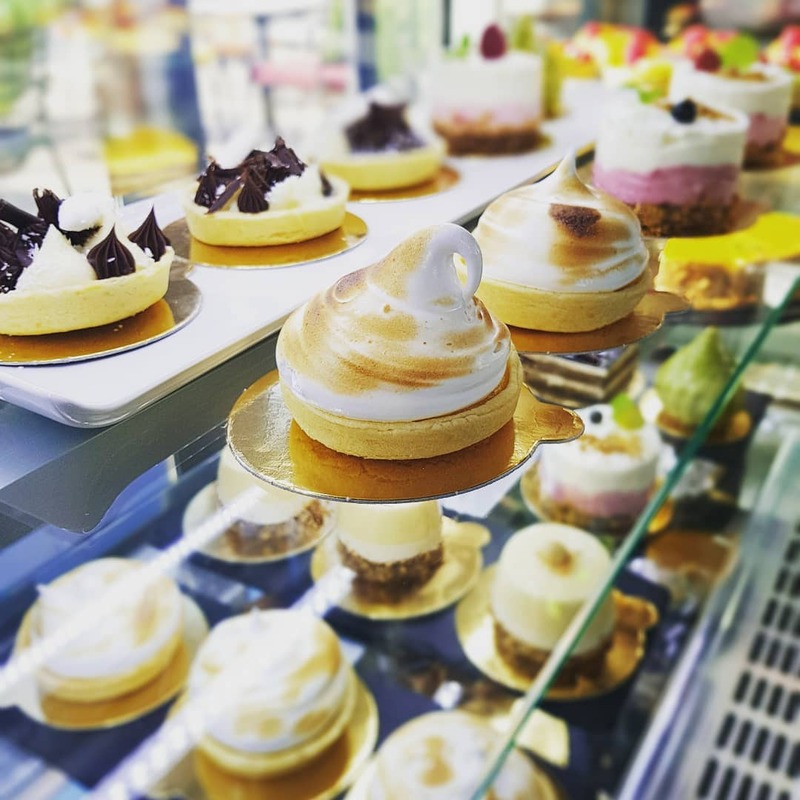 From tarts and pastries to individual cakes and buns, here’s definitely where you want to have your cake and eat it too. Another nice coffee shop and bar is Indie, located a street or two away from Five Wells Square on Ul. Federica Grisogona 6. It seemed newly-opened when we went there for a couple of espressos and some time out from sightseeing. Young, hip crowd and a great selection of drinks, from coffee to beer and spirits. Important to note that unlike Ireland, the UK and many other countries, that smoking is still permitted indoors in ventilated cafes and bars, which isn’t ideal for anyone adverse to cigarette smoke. 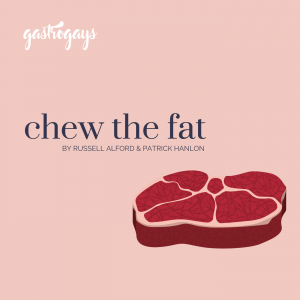 Since our tagline is ‘Food. Travel. 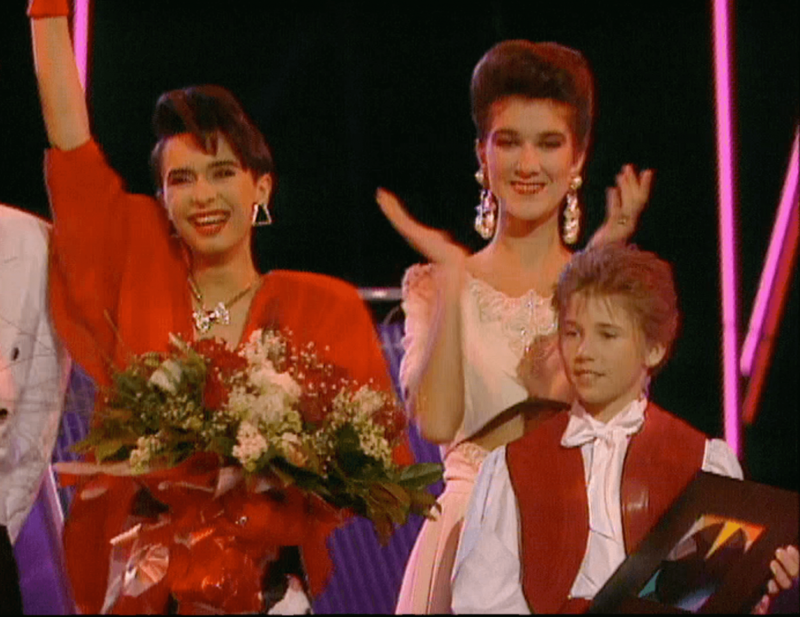 Eurovision’, ESC fans will appreciate that Riva’s lead singer, Emilja Kokić, who won the Contest for Yugoslavia for the first and only time with ‘Rock Me Baby’ in 1989 is from Zadar. Which leads us to the little-known fact that Croatia has technically hosted Eurovision once before, yet the country has never officially won. When Yugoslavia won for its first and only time, the contest was held in Zagreb in May 1990 – which is now Croatia’s capital. Just over 12 months later, Croatia declared independence from Yugoslavia following the fall of communism in Eastern Europe. We’d love to see Croatia win and host sometime soon! 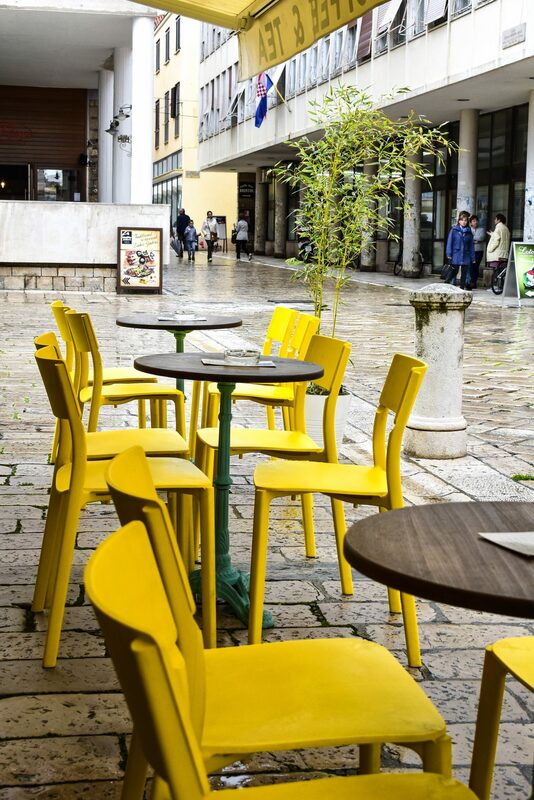 Zadar Airport is a 20 minute drive from the centre of the city. Uber is available in the city, and a car into the town shouldn’t cost you more than €20. Car hire is available at the airport too. The airport is served by Croatian Airlines (a 45 minute internal flight to the capital, as well as Pula) and is also a Ryanair base connecting it to the likes of Dublin, London Stansted, Frankfurt, Gothenburg, Paris-Beauvais, Marseille and Manchester. The airport is very small so be sure to leave plenty of time for your departure, especially on busier days. 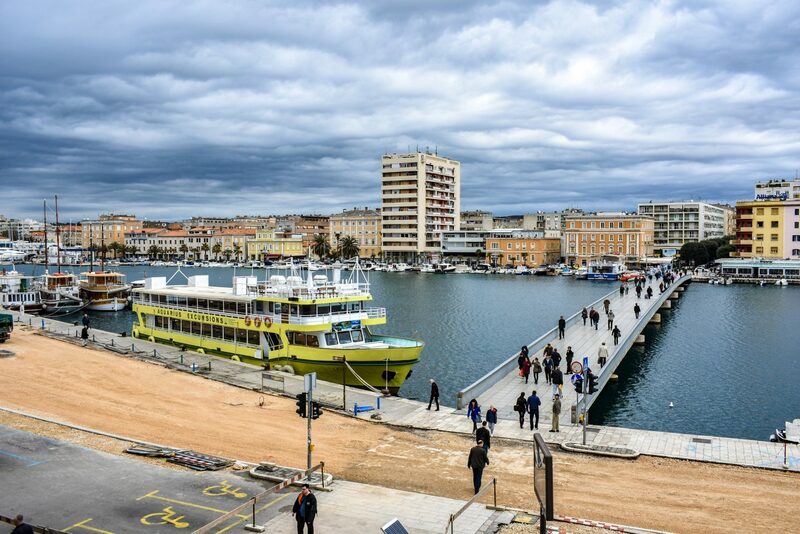 Zadar is connected to Zagreb by bus, which takes roughly 3.5 hours but is cheap, efficient and air-conditioned. While there is a train station into the city, it’s a single line which connects with Knin, in the heartland of Croatia- from there you can travel towards Zagreb and Split (though a journey to the former can take between 5 and 8 hours). 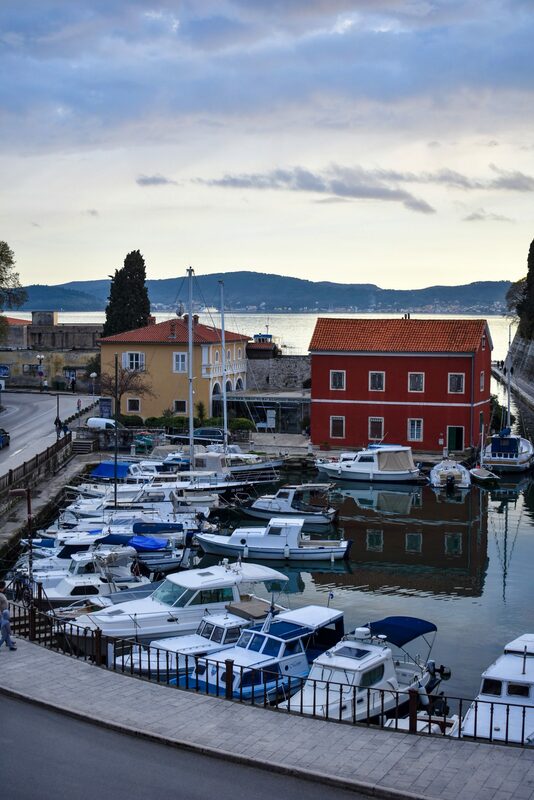 You can travel to the Croatian archipelago by local boat services from Zadar and to Ancona in Italy by ferry. 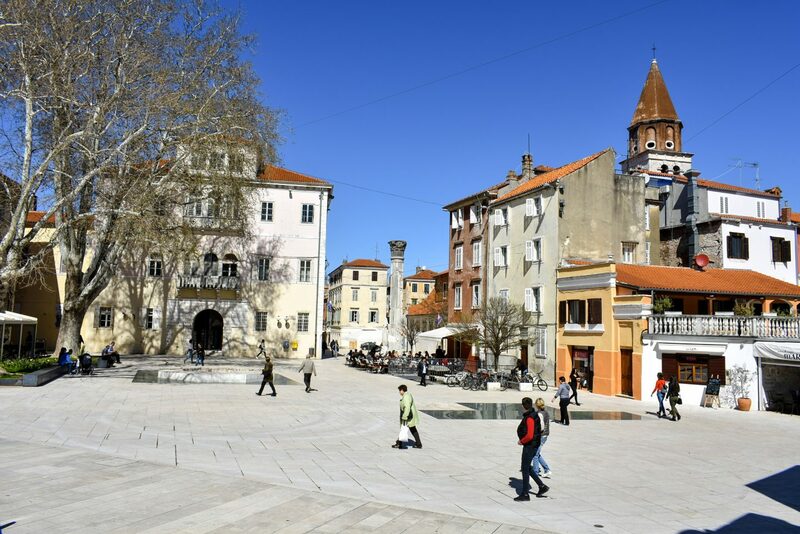 In terms of temperature, at the peak of the summer (June-August) it usually hovers between 22 and 30ºC, but in general Zadar has a mild, Mediterranean climate. 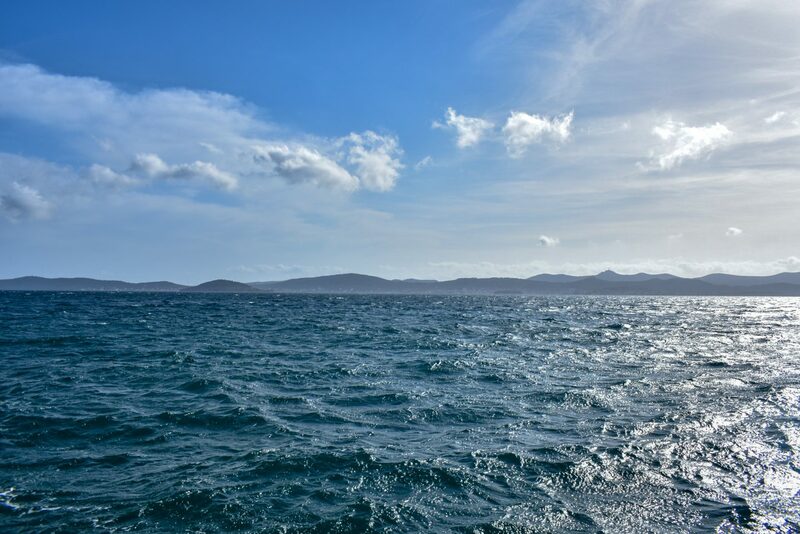 It hardly ever goes down to 0ºC, but rain can be frequent, year-round. 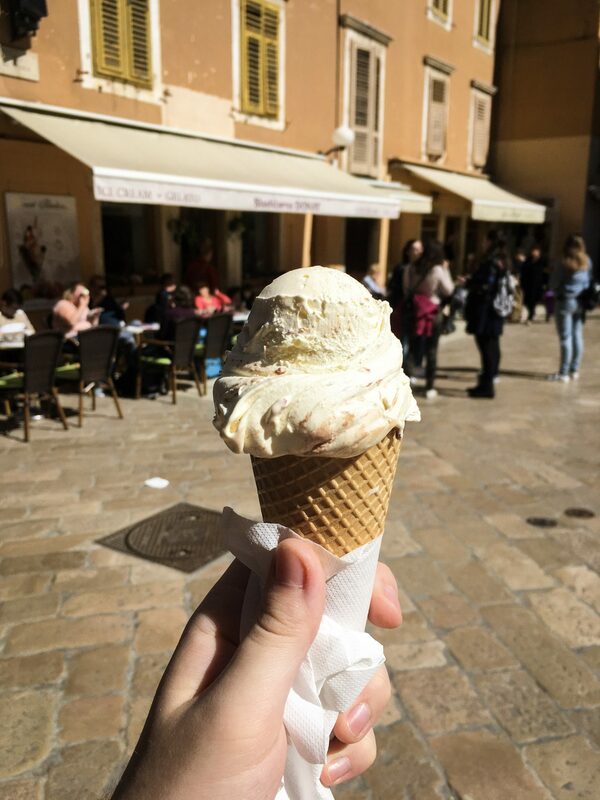 Disclaimer: As mentioned above, our trip to Zadar was part of a srprs.me experience.